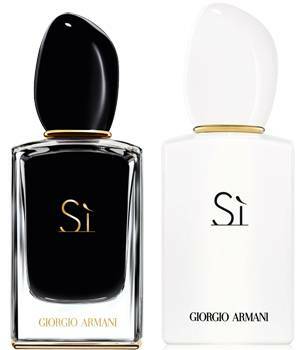 Giorgio Armani introduces the extreme passion of Sì Eau de Parfum Intense: an exhilarating tribute to a bold and risk-taking woman. Launched in 2013, Sì embodies an irresistibly modern femininity. A woman of grace and independent spirit; admired for her sophistication, serene in her self-confidence and, when she chooses, highly seductive. Accomplished. Audacious. Glamorous. She finds strength in desire. For her, Sì Eau de Parfum Intense is a declaration of sublime elegance. An emphatic 'yes" to these emotions, to taking chances and to having it all. Sì Eau de Parfum Intense pushes the limits of sensuality. A carnal embrace wrapped in iconic black, it intrigues and captivates. Darkly radiant against bare skin, it is the essence of Italian style, the debut of an unforgettable attraction. A new archetype for the passionate woman, Sì Eau de Parfum Intense accentuates the sensual and elegant facets of the Armani woman. More textured, it takes the uniquely modern chypre accord of Sì to unexpected depths. Enveloping the fragrance in luxurious black harmonies. Composed of infinite nuances, black is luminous in its seduction, profound in its mystery. A duality that has been masterfully translated in an olfactive elixir of bright nectars deepened with addictive vanilla bean, black woods and ambery resins. With captivating clarity, blackcurrant neo jungle essence, a note extracted from the very heart of the fruit, is illuminated with zesty bergamot and mandarin essences, with just a hint of silky freesia. Opulent, floral and intensely feminine, the heart offers an exquisite bouquet of rose de mai superessence and neroli absolute, made even more sophisticated with velvety davana and osmanthus blossom. Warming to the skin, the fragrance reveals its carnal nature. Intoxicating sensual notes of vanilla absolute are made even more sumptuous with vanilla pure jungle essence. Lingering over resinous fir balsam, golden benzoin and the dark woodiness of orcanox and patchouli. A fragrance of passion, softly powerful, assertive and unmistakably feminine. Mysterious. Timeless. The sinuous, sculptural cap appears to melt into the signature Sì bottle. Molten onyx caught within the bright transparency of the chiseled glass. The tailored lines are edged with rings of gold, its interior obscured by the velvety black lining. The 3-D lacquered effect was inspired by hand-blown Murano glass. Its depth and layering achieved with the innovative thermal fusion of an exclusive hybrid glass to a traditional glass. In this case, solid black against clear transparency to amplify the bottle's precious nature. A sensual object as powerful as the emotions it incites. Available Nationally in Myer on 19th October, and in David Jones on 9th November 2014. Available Nationally in Myer on 8th November 2014.